JAKARTA, Indonesia — The families were still mourning relatives lost in the crash of Lion Air Flight 610 in Indonesia when they were crammed into a hotel conference room a few weeks after the crash. Sign this form, they were told by employees of the low-cost carrier, and they would receive 1.3 billion rupiah, or $ 91,600. For those who lost breadwinners in the crash on Oct. 29, the money, government-mandated compensation for loss of life in an aviation accident, was welcomed. But that amount, while not insignificant for desperate families with bills to pay and children to school, was roughly the minimum they were entitled to receive under Indonesian law. And the conditions imposed by Lion Air before it would disburse the payments were complicated and shocking, with some legal experts questioning their legality. To collect the money, families had to sign a pledge, called a release and discharge, that they would not pursue legal action against Lion Air, its financial backers and insurers, as well as Boeing, which manufactured the nearly brand-new 737 Max 8 plane. Moreover, the signers promised not to disclose the terms of the agreement itself, a copy reviewed by The New York Times shows. Yet an Indonesian aviation act from 2011 specifies that when heirs receive the government-mandated payment, they do not give up their right to pursue legal action against a carrier or other entities that may have been involved in an air accident. The document that relatives signed included an eight-page list of hundreds of other companies, many subcontractors for Boeing, which also could not be sued if relatives were to claim the money. Boeing officials declined to comment on the agreement’s terms. Nearly five months after Flight 610 hurtled into the Java Sea, many questions remain about what caused the accident, which was followed on March 10 by the crash of Ethiopian Airlines Flight 302, another nearly new Boeing Max 8, outside Addis Ababa, the Ethiopian capital. Investigations have centered on whether pilots may have been foiled by an automated system designed to prevent stalls in the Max 8 that could have pitched the plane forward into a fatal nose-dive when triggered by false data. But for the families of the 189 people who died on Flight 610, some say their grief has been exacerbated by an effort to pressure them to accept low compensation and renounce all rights to sue. A Lion Air official videotaped the family members who signed the form, some of the signatories said. Mr. Latief is among those who refused to sign. The Indonesian Ministry of Transportation has sent letters to Lion Air reminding the carrier of its obligation to conform to aviation regulations. A few days ago, the ministry received a reply from Lion Air saying they would comply, transportation officials said. Lion Air officials did not respond to questions about the form. Following the Ethiopian Airlines crash earlier this month, countries around the world grounded the 737 Max 8. The United States Department of Transportation has begun looking at investigating the Federal Aviation Administration’s certification of the best-selling plane model. Pilots who flew the Max 8 said they were not adequately informed about the new automated stall-prevention system, nor were they instructed how to disable it should incorrect data prompt it to seize control of the plane and propel its nose down. “Having two horrible accidents within months of each other has put the focus in the United States on what is going on with the Max 8 and it strengthens our position on Lion Air,” said Mr. Herrmann, who is also considering pursuing legal action against the Federal Aviation Administration for certifying the plane model. Lion Air did not respond to requests for comment on her accusations. Mr. Latief, whose son, Muhammad Luthfi Nurrandhani, was among the Lion Air 610 victims, took notice at how Tewolde GebreMariam, the chief executive of Ethiopian Airlines, quickly traveled to the Flight 302 crash site and that other senior airline employees were seen comforting grieving family members. His son, Mr. Latief said, left behind a pregnant wife, who has since given birth to a boy. 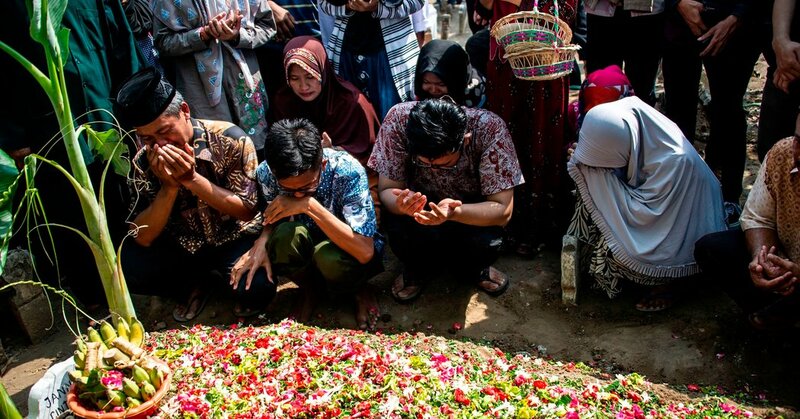 In November, the family took Mr. Luthfi’s remains that were recovered from the Java Sea and buried them in Jakarta. Two months later, health officials called and said they had more remains that they had neglected to give Mr. Latief earlier. Did he want them? Mr. Latief said he did not want to upset his wife so he had a second, tiny coffin constructed and quietly buried it without telling her.